We make these quite often during the summertime, especially when we are camping, but they are good anytime of year. The kids helped me assemble them today. They are easier to assemble before hand and then grill at dinnertime. Place 5 pieces of aluminum foil (shiny side up) on counter. Spray with cooking spray. 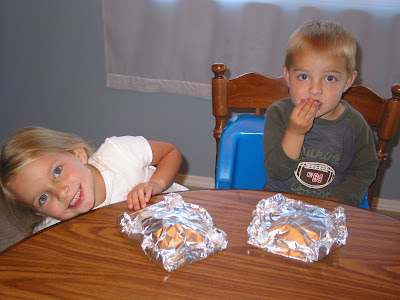 Put chicken breast pieces on each foil piece. Cover chicken with BBQ sauce and a little honey. Salt and pepper chicken pieces. 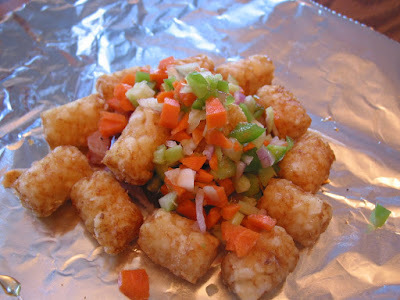 Cut up carrots, onion, celery and green pepper into small pieces. Mix together in a bowl. 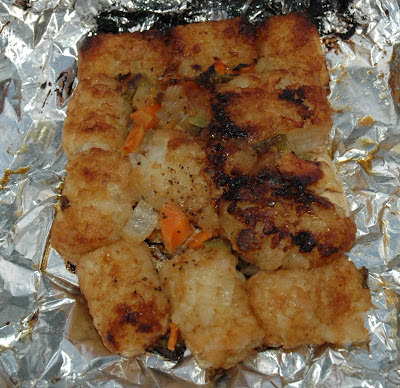 Place cut-up veggies on top of chicken (inside the "potato wall"). 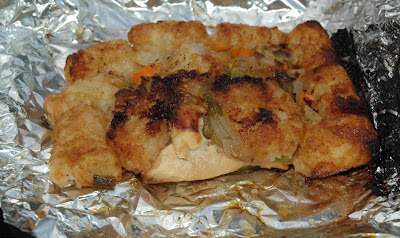 Cover chicken and veggies with another piece of tinfoil (shiny side on the inside). Roll up the foil, so all the edges are closed. Grill on medium for 14 minutes on each side. Make sure to check one to make sure the chicken is done. If you are camping and have a fire, make good cooking coals and cook for the same time as if you were grilling. Or you can bake them in your oven on 400 for about an hour. Enjoy! My little helpers munching on frozen tatortots (yuck!). ***Ground Beef or Turkey version -- Make patties of ground beef or ground turkey and use in place of chicken. I usually don't add BBQ sauce or honey to them, I just salt and pepper and make them like the chicken version.